Mon–Fri: 10 a.m. to 9 p.m.
Family Day: 10:00 a.m. to 6:00 p.m.
Good Friday: 10:00 a.m. to 6:00 p.m.
Easter Sunday: 10:00 a.m. to 6:00 p.m.
Victoria Day: 10:00 a.m. to 6:00 p.m.
Canada Day: 10:00 a.m. to 6:00 p.m.
Civic Holiday: 10:00 a.m. to 6:00 p.m.
Labour Day: 10:00 a.m. to 6:00 p.m.
Thanksgiving Day: 10:00 a.m. to 6:00 p.m.
Remembrance Day: 10:00 a.m. to 6:00 p.m.
Black Friday: 6:00 a.m. to 9:00 p.m.
Christmas Eve: 10:00 a.m. to 5:00 p.m.
Boxing Day: 8:00 a.m. to 9:00 p.m.
New Year’s Eve: 10:00 a.m. to 5:00 p.m.
Cabela's Nanaimo is located at 6902 Island Hwy. N. in the Dickinson Crossing Shopping Centre and is a 50,000-square-foot store. 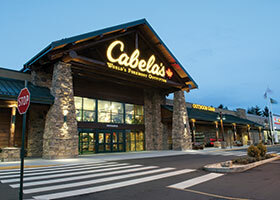 The building’s exterior reflects Cabela’s popular store model with log construction, stonework, wood siding and metal roofing. The interior surrounds customers in an outdoor experience, including museum-quality wildlife displays and thousands of quality outdoor products. There is currently no promotion available for this store. Come in to Cabela's to get all of your hunting or fishing licences. B.C. resident hunters will need a Fish & Wildlife ID (FWID) to apply for Limited Entry Hunting or to buy a hunting licence. The FWID replaces the old B.C. resident Hunter Number card. There is no cost to obtain one. Your FWID is linked to your personal online profile, which can be updated at any time. We can issue you a Saltwater or Freshwater Fishing Licence and provide the latest B.C. fishing regulations synopsis. Two pieces of valid identification are required. Stop by Customer Service to get your documents while you shop for all your gear for your next legendary adventure. Everyone loves the Easter Bunny. Bring the whole family for a free 4x6 photo with the sweetest rabbit of all. The first 75 kids to come by from 5:30­ to 7:30, April 15–18, will receive a free gift. Don’t miss out on this fun and festive opportunity! We’re going on a hunt…an Easter egg hunt! Join us at Cabela’s for a variety of Easter-themed fun and activities. Search the store for 5 eggs and return them for the sweetest prize of all—candy! Be sure to get your picture with the Easter Bunny while searching the store for festive eggs. Come celebrate Easter the Cabela’s way! Get crafty with the whole family at our free Easter craft station. Decorate a festive wreath (April 13–14) to hang on the front door or fridge. Complete a hanging bunny craft (April 19), and create a standing Easter bunny (April 20–21). Test your creativity and satisfy your sweet tooth with Cabela’s. Dog lovers, this day is for you. Join us at Cabela’s for a day of dog-themed fun and activities, including free dog photos, seminars on dog training, health and wellness and great doggy-bag giveaways. While you are enjoying yourself, check out the latest dog products. Stock up on beds, pet supplies, hunting apparel and the latest state-of-the-arf dog training equipment. All activities will take place outside, so bring your best furry friend dressed for the season (weather permitting). Show mom she matters most with Mother's Day festivities at Cabela's. Come get a photo with mom and receive a free 4x6 photo. Ask about our photo packages! Get down early on the big day, because the first 75 customers to get their photo taken on May 12 will receive a free giveaway. Are your children bored while you shop? How about a scavenger hunt to keep them busy while you browse? Pick up the scavenger hunt sheet from customer service, complete and return to get a prize! Thinking about getting a new bow? Want to try it before you buy it? Visit our very own indoor archery range and test our archery equipment. Our Outfitters will help you find the right piece of equipment for your next outdoor adventure. We were born to work here. Were you? Work hard, play hard. It’s a good motto to live by, though here at Cabela’s you might not be able to tell the two apart. In a place where work and play are two facets of the same single passion, work is more fun and play is more serious. We approach all of it with fanatic energy—whether we’re on the job, in the field, or on the water. Helping someone else enjoy a superb outdoor experience is just as satisfying as having one of our own. And if you share this passion, you’re family—no matter where you come from or where in the company you work. Stop by the Fudge Shop and sample any of our world-famous fudge for free. Cabela's is interested in acquiring good working condition and functional firearms of nearly every description - old or new, plain or fancy - field models and collector grades. Whether it's a single piece or an entire collection, we are always looking to purchase quality inventory. To have your firearms evaluated please email brian.grouhel@cabelas.ca to book an appointment. If you're a couple whose wedded bliss will have firm footing in a shared love of the great outdoors, there are plenty of options here at Cabela’s. You may be starting a new life together with your spouse-to-be, but there’s a good chance you already have a well-stocked kitchen and some decent linens in your life. Start making memories outside with our unique selection of gifts for your outdoors adventures. We've made it easier for you to let your wedding guests know what you'd love to have. To start your own wedding registry, visit our customer service counter.